Swim Wales is the national governing body whose vision is to deliver excellence and inspire the nation to enjoy, participate, learn and compete in Welsh aquatics. 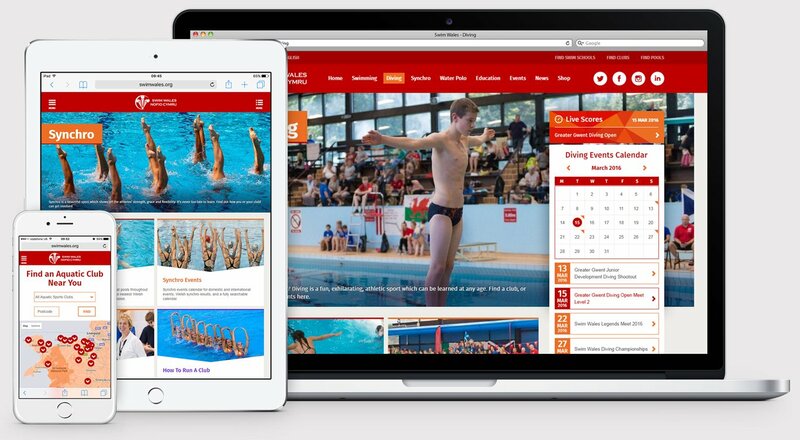 The new Swim Wales website is now fully responsive allowing visitors to browse content effortlessly from all devices, viewing events and results, finding pools, clubs and news, wherever they are. The site has been restructured, primarily into the 4 main aquatic sports: swimming, diving, synchronised swimming and water polo. Visitors to the site can find learning courses, event information, Welsh aquatic clubs, swim schools and swimming pools and much more. The website is built on the new version of Marmalade Suite (MSuite 3.0) – our content management and development framework built within Laravel. The content management system (CMS) includes an ‘events’ module which manages the site’s events calendar and publishes live results; a ‘people’ module for managing profiles of Swim Wales staff, aquatic coaches and athlete profiles and the national hall of fame, and a ‘shop’ module for managing merchandise, inventory and distribution. Additional modules include tools for managing leisure centres, ‘Learn to Swim’ schools, aquatic clubs, courses, key documents and news. Within each bespoke module we’ve provided a suite of media widgets that allow the Swim Wales team to create dynamic, media rich pages. The events module provides Swim Wales with the tools to manage all aquatic events – from national team swim meets to instructor training sessions. The CMS adds each event to the event calendar, lists it on the side panel and plots the event location onto embedded Google maps. The events module combined with the page builder tools provide the flexibility to customise the content for each event – providing, for example, a mechanism to add event entry forms, qualifying criteria and the event results. There is also an option to share the events on the Swim Wales social media platforms. The Swim Wales website provides a comprehensive directory of each and every swimming pool and aquatic club in the country. Each club has been classified by both aquatic sport (swimming, diving etc.) and the sport level (school, standard, performance or high performance). The website allows visitors to browse through maps or do post code proximity searches to find the exact type of club they are interested in joining. 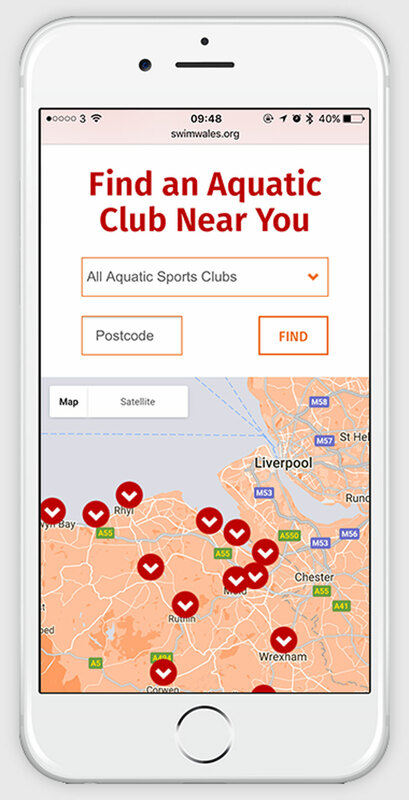 The website also integrates with the AquaPassport national ‘Learn to Swim’ programme making it easy to find local swim school providers. So, whether you are searching for your nearest swimming facility for a family outing, or you are looking to become the next Tom Daley, all the information you need can be found quickly and easily. The CMS also has a module for fully managing training courses, enabling Swim Wales to setup and run courses for all aquatic sports across teaching, coaching, and volunteering. Course information includes the dates and times, duration, course location, prices, qualifications achieved and number of available places. Additional bespoke course content can be added using media widgets (descriptions, links, documents, videos and contact details). Course applications, bookings and payments can all be made through the website. The Swim Wales shop sells various aquatic awards and merchandise, such as event certificates, hoodies and t-shirts. Although the shop is fairly simple, the CMS does provide the tools for Swim Wales to create shop categories, include product descriptions and images, manage stock levels, and manage product SKU attributes (size, colours etc.). The intuitive check out process uses PayPal as a payment gateway. With 23% of people in Wales speaking the Welsh language, it was vital that a Welsh national governing body has a multi-language website. The Swim Wales website is available in Welsh via a language switch at the top of each page. Each module within the Marmalade Suite provides the option to add content in both English and Welsh. Every multi-lingual website component from news content to ALT tags to SEO meta data can managed with the content management tools.